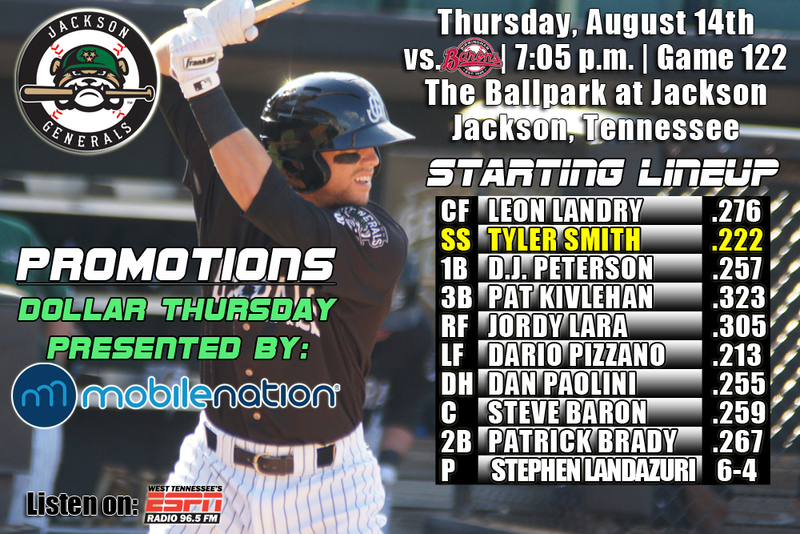 • The Generals wrap up a 6-game series in 5 days with their North Division rival Birmingham Barons tonight (3-2)…Jackson is 9-5 this season against the Barons and 6-3 in games played in Jackson…the Generals have won 4 of their last 7 series’ overall. • The game can be heard on 96.5 ESPN, online at jacksongeneralsbaseball.com or TuneIn Radio. • The Generals scored a run in the bottom of the first inning for a 1-0 lead, but allowed 3 unanswered runs as Jackson fell to Birmingham 3-1 on Friday night. • CF Leon Landry (3×4, R, 2B, SB) and DH Dario Pizzano (2×4, 2B) combined to record 5 of the Generals 8 hits. • Starter Victor Sanchez (6.0,8,2,2,4,4) recorded the loss, allowing 2 runs on 8 hits over 6.0 innings. RH Trevor Miller (2.0,0,1,0,0,0) and RH Stephen Shackleford (1.0,0,0,0,0,3) combined to allow 1 run (0 ER) over 3.0 hitless innings in relief. • Jordy Lara currently has 161 hits this season between High Desert and Jackson, which leads all of the minors…Wilmer Difo of the HagerstownTigers is 2nd with 159…Lara also ranks T-5th in the minors in extra-base hits (62) and 11th in OPS (.991). • Barons visit Jackson again – The Generals are hosting Birmingham for the second time this season and are 6-3 in games at Jackson and 9-5 overall…As a team the Generals are batting .303 against Birmingham this season with 70 runs scored in 14 games. 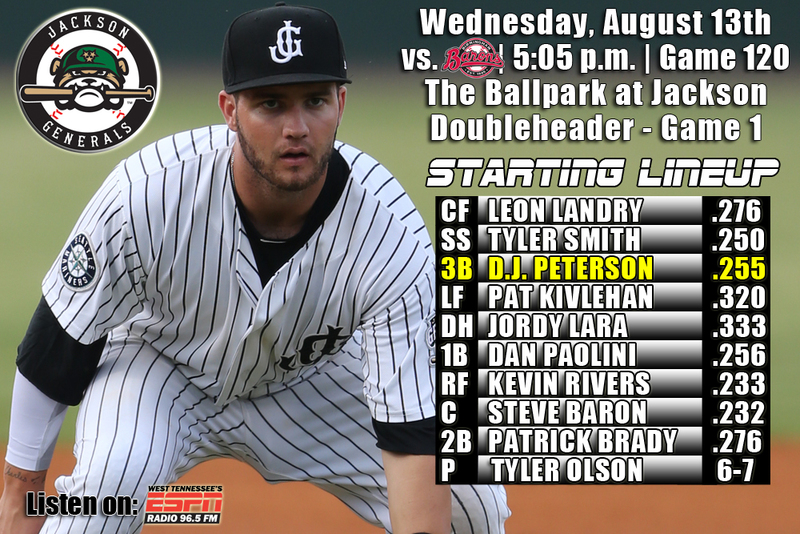 • Since 2005, the Generals/Diamond Jaxx are 46-25 (.648) against the Barons in games played in Jackson. • Getting it done on the mound – Jackson is 8-6 in August and posted a 2.87 ERA. • Over his last 3 starts in August, LH Tyler Olson is 2-1 with a 0.47 ERA (1 ER, 19.1 IP). During this stretch he has limited opponents to a .200 (14×70) average, while walking 4 and striking out 16. • LH Kyle Hunter has not allowed a run over his last 16.1 innings (9G/1GS). During this stretch, since July 16, Hunter has limited opponents to a .193 (11×57) average, while walking 4 and striking 7. • Since May 24, RH Stephen Shackleford is 3-1 with a 1.38 ERA (4 ER, 26.0 IP) in 20 relief appearances. During this 20 game stretch he has lowered his season ERA from 4.71 to 3.13, while striking out 38 batters in 26.0 innings. • RHP Trevor Miller earned his 2nd save in his last 3 outings Tuesday night. Miller is now 2-1, with a 1.64 ERA, with 39 strikeouts and 11 walks in 14 games as a reliever. As a starter, Miller is 3-7, with a 5.45 ERA, with 46 strikeouts and 30 walks in 13 starts. • C Steve Baron has hit safely in 6 straight games, including 4 straight multi-hit efforts, batting .500 (11×22) with 2 runs, 3 doubles, 3 RBI and a stolen base. He has upped his average from .175 to .290. • INF Patrick Kivlehan currently has a 7-game hit steak, batting .407 (11×27) with 6 runs scored, 3 doubles, 1 triple, 1 home run, 6 RBI and 2 walks. He has also hit safely in 12 of his last 13 games, batting .375 (18×48) with 10 runs scored, 3 doubles, 1 triple, 2 home runs, 8 RBI, 6 walks and 3 stolen bases. • After recording 1 hit in his first 14 AA at-bats (.071), OF Jordy Lara his hit safely in 12 of his last 14 games, batting .358 (19×53) with 6 runs scored, 7 doubles, 1 home run, 13 RBI and 3 walks. Overall Lara is batting .299 (20×67) with 7 runs scored, 8 doubles, 1 home run, 13 RBI and 6 walks in 18 games with Jackson. • The Generals are in the midst of playing 21 games in 21 days to close the season (3-2) including 6 more home games (BIR, CHA) with road trips to Huntsville and Montgomery. 11 of the final 16 games are against North Division foes. Jackson is 32-27 against their remaining opponents. • INF/OF Patrick Kivlehan currently ranks 1st in the Southern League in batting (.321) and 3rd in slugging percentage (.524). Kivlehan also ranks 4th in the M’s organization in average (.308), 4th in HR (19) and 2nd in RBI (95) between Jackson and High Desert. Kivlehan ranks T-2nd in all of MiLB having played in 122 games this season. He ranks 4th in the minors in RBIs with 95. • The Generals continue a 6-game series in 5 days with their North Division rival Birmingham Barons with game 4 of the series (3-1)…Jackson is 9-4 this season against the Barons and 6-2 in games played in Jackson…the Generals have won 6 of their last 10 games and 4 of their last 7 series’ overall. • The Generals scored 5 runs combined between the 2nd and 3rd inning to take a 5-2 lead, but Jackson fell to Birmingham 6-5 on Thursday night. • C Steve Baron (3×4, RBI) led the team with 3 hits, while LF Dario Pizzano (1×4, R, 2B, 3 RBI, BB) drove in 3 of the Generals 5 runs. • Starter Stephen Landazuri (4.0,7,5,5,3,3,3HR) allowed 5 runs on 7 hits over 4.0 innings, but did not factor into the decision. LH Nick Hill (1.1,1,0,0,1,1) and RH Mayckol Guaipe (1.0,2,0,0,0,1) each had a scoreless outing, while RH Moises Hernandez (2.2,2,1,1,1,0) recorded his 7th loss after allowing a run in the top of the 8th inning. 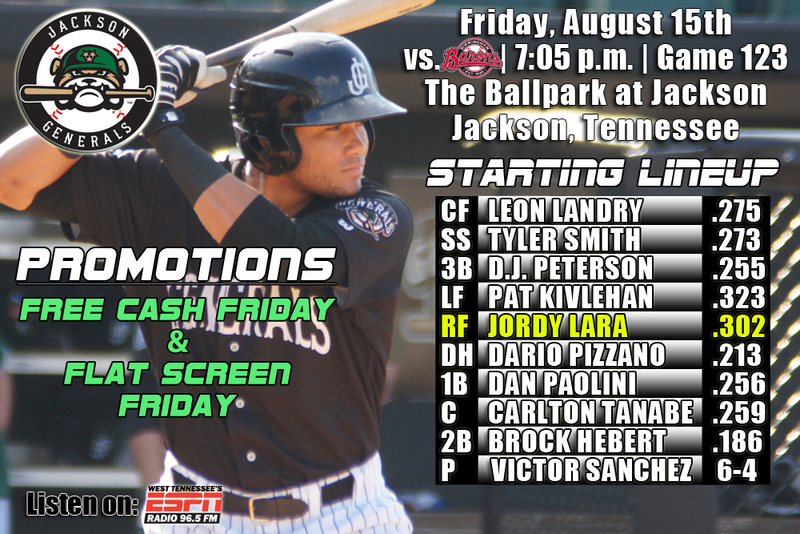 • Jordy Lara currently has 160 hits this season between High Desert and Jackson, which leads all of the minors…Mississippi’s Jose Peraza and Wilmer Difo of the HagerstownTigers are T-2nd with 158…Lara also ranks T-5th in the minors in extra-base hits (62) and 11th in OPS (.995). • The Generals are in the midst of playing 21 games in 21 days to close the season (3-1) including 7 more home games (BIR, CHA) with road trips to Huntsville and Montgomery. 12 of the final 17 games are against North Division foes. Jackson is 32-26 against their remaining opponents. • YOU ALREADY KNEW that Jordy Lara was leading the minors in hits, but DID YOU KNOW? that in RBI’s, D.J. Peterson ranks 3rd in all of the minors (97), while Patrick Kivlehan ranks 4th (96) and Lara 7th with 93 this season. 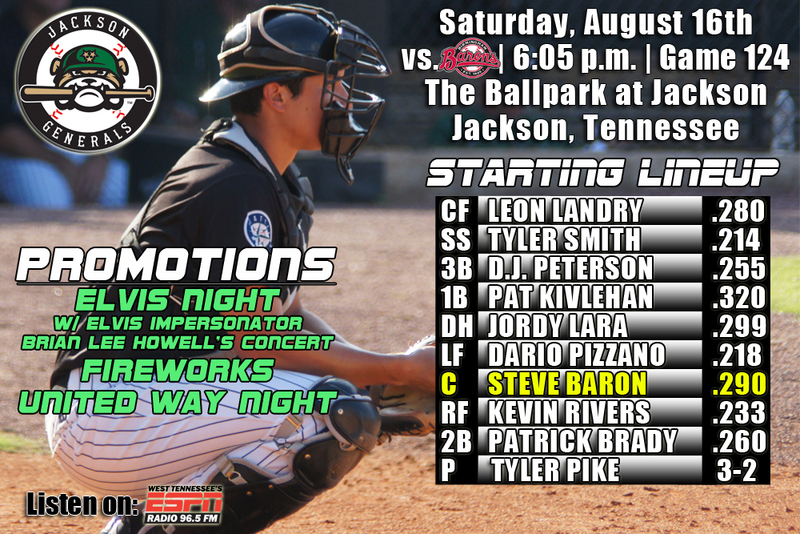 • Barons visit Jackson again – The Generals are hosting Birmingham for the second time this season and are 6-2 in games at Jackson and 9-4 overall…As a team the Generals are batting .307 against Birmingham this season with 69 runs scored in 13 games. • Since 2005, the Generals/Diamond Jaxx are 46-24 (.657) against the Barons in games played in Jackson. • Getting it done on the mound – Jackson is 8-5 in August and posted a 2.95 ERA. • Since May 24, RH Stephen Shackleford is 3-1 with a 1.44 ERA (4 ER, 25.0 IP) in 19 relief appearances. During this 19 game stretch he has lowered his season ERA from 4.71 to 3.19, while striking out 35 batters in 25.0 innings. • INF Patrick Kivlehan has hit safely in 10 of his last 12 games, batting .386 (17×44) with 10 runs scored, 3 doubles, 1 triple, 2 home runs, 8 RBI and 6 walks. • After recording 1 hit in his first 14 AA at-bats (.071), OF Jordy Lara his hit safely in each of his last 11 of his last 13 games, batting .367 (18×49) with 6 runs scored, 7 doubles, 1 home run, 13 RBI and 3 walks. Overall Lara is batting .302 (19×63) with 7 runs scored, 8 doubles, 1 home run, 13 RBI and 6 walks in 16 games with Jackson. • INF/OF Patrick Kivlehan currently ranks 1st in the Southern League in batting (.321) and 3rd in slugging percentage (.527). Kivlehan also ranks 4th in the M’s organization in average (.309), 4th in HR (19) and 2nd in RBI (95) between Jackson and High Desert. Kivlehan ranks T-2nd in all of MiLB having played in 121 games this season. He ranks 4th in the minors in RBIs with 95. • The Generals continue a 6-game series in 5 days with their North Division rival Birmingham Barons today with game 4 of the series (3-0)…Jackson is 9-3 this season against the Barons and 6-1 in games played in Jackson…the Generals have won 7 of their last 10 games and 4 of their last 7 series’ overall. • The Generals picked up their 2nd double header sweep of the season Wednesday with a walk-off 2-1 victory in game 1 and an 8-1 win in the nightcap over Birmingham. • With the wins, Jackson pulled within a game of the North Division leaders Tennessee and Chattanooga. • 3B D.J. Peterson had walk-off RBI single with 1 out in the bottom of the 7th inning as Jackson defeated Birmingham 2-1. LF Patrick Kivlehan (2×3) and C Steve Baron (2×2, R, BB) had 2 of the Generals 8 hits. DH Dan Paolini hit his 12th home run of the season with a solo home run that tied the game 1-1 in the 3rd innings. • Starter Tyler Olson (7.0,7,1,1,1,4) allowed 1 run on 7 hits in a 7.0-inning complete game to earn his 7th win of the season. It was his 2nd career complete game and first since July 10, 2013 at Eugene with Everett (9.0,1,0,0,1,10). • In game 2, 3B D.J. Peterson hit his 26th home run of the season and drove in 3 runs as Jackson picked up an 8-1 victory over Birmingham. • The Generals scored 8 runs on only 3 hits, but took advantage of 9 walks and 3 errors. • Peterson (1×4, R, HR, 3 RBI), 2B Tyler Smith (1×2, R, RBI) and 1B Patrick Kivlehan (1×4, R, 3B) each recorded 1 of the team’s 3 hits. • Starter Kyle Hunter (3.1,2,0,0,1,1) allowed only 2 hits in 3.1 scoreless innings, but did not factor into the decision. RH Stephen Shackleford (1.2,1,0,0,1,3) recorded his 6th win after tossing 1.2 scoreless innings. RH Matt Brazis (2.0,2,1,1,1,3) allowed 1 run in the top of the 7th inning before closing it out. • Jordy Lara currently has 159 hits this season between High Desert and Jackson, which leads all of the minors…Mississippi’s Jose Peraza…Lara also ranks T-5th in the minors in extra-base hits (61) and 11th in OPS (.996). • The Generals are in the midst of playing 21 games in 21 days to close the season (3-0) including 8 more home games (BIR, CHA) and road trips to Huntsville and Montgomery. 15 of the final 20 games are against North Division foes. Jackson is 32-25 against their remaining opponents. • YOU ALREADY KNEW that Jackson walked off with a 2-1 victory in game one yesterday, but DID YOU KNOW? that it was only Jackson’s 2nd walk off this season (last 4/13 vs. MIS). • Barons visit Jackson again – The Generals are hosting Birmingham for the second time this season and are 6-1 in games at Jackson and 9-3 overall…As a team the Generals are batting .310 against Birmingham this season with 64 runs scored in 12 games. • Since 2005, the Generals/Diamond Jaxx are 46-23 (.667) against the Barons in games played in Jackson. • Miller finding his place as a reliever – RHP Trevor Miller earned his 2nd save in his last 3 outings Tuesday night. Miller is now 2-1, with a 1.64 ERA, with 39 strikeouts and 11 walks in 14 games as a reliever. As a starter, Miller is 3-7, with a 5.45 ERA, with 46 strikeouts and 30 walks in 13 starts. • Relieving Guaipe – RHP Mayckol Guaipe has a 2.25 ERA in 32 games this season, with 47 strikeouts and only 8 walks… He ranks 3rd among SL relievers having just walked 8 batters in 48.0 IP…he also ranks 1st in fewest baserunners/9IP ratio at 8.44 (45/48.0 IP). • Landry is the toughest in the league to strikeout – OF Leon Landry is 1st in the Southern League in fewest strikeouts, fanning just once in every 9.56 at-bats. • C Steve Baron has hit safely in 5 straight games, including 3 multi-hit efforts, batting .444 (8×18) with 2 runs, 3 doubles, 2 RBI and a stolen base. He has upped his average from .175 to .259. • INF Patrick Kivlehan has hit safely in 5 straight games, including 3 multi-hit efforts, batting .500 (9×18) with5 runs, 2 doubles, a triple, home run and 5 RBI…He has also hit in 10 of his last 11 games, batting .410 (16×39) with 9 runs scored, 2 doubles, a triple, 2 home runs, 7 RBI and 7 walks. • OF Jordy Lara had his 10-game hitting streak end on Wednesday, but has hit in 10 of 12 games,, batting .378 (17×45) with 4 runs scored, 6 doubles, 1 home run, 13 RBI and 2 walks. Overall Lara is batting .305 (18×59) with 5 runs scored, 7 doubles, 1 home run, 13 RBI and 5 walks in 16 games with Jackson, including 6 multi-hit games. • The Generals continue a 6-game series in 5 days with their North Division rival Birmingham Barons today with a doubleheader…Jackson is 7-3 this season against the Barons and 4-1 in games played in Jackson…the Generals have won 4 of their last 7 series’ overall, but dropped 3 of 5 on recent road trip at Pensacola. • The Generals posted their 9th shutout of the season on Tuesday as they defeated Birmingham 4-0 to open the series. • Starter Cam Hobson (6.0,7,0,0,3,3) and reliver RH Trevor Miller (3.0,2,0,0,0,4) combined for a 7-hit shutout as Hobson (8-9) became Jackson’s first 8-game winner on the mound. Miller collected his 2nd save in his last 3 outings. • 1B Jordy Lara (2×4, 2 RBI) broke a 0-0 tie in the bottom of the 6th with a 2 run single. RF Kevin Rivers (1×4, R) and C Steve Baron (2×4) added RBI’s in the 8th inning to extend the lead to 4-0. • Hey General Manager Jason Compton, you knew the Generals and Barons were playing a doubleheader today, but DID YOU KNOW? that the Generals and Barons have played the 2nd-fewest doubleheaders in the Southern League this season? Each have played 3 and are 4-2 in 7-inning games in 2014. Chattanooga has played the fewest with just 3 7-inning contests. • Barons visit Jackson again – The Generals host Birmingham for the second time this season and are 4-1 in games at Jackson and 6-3 overall…As a team the Generals are batting .320 against Birmingham this season with 54 runs scored in 10 games. 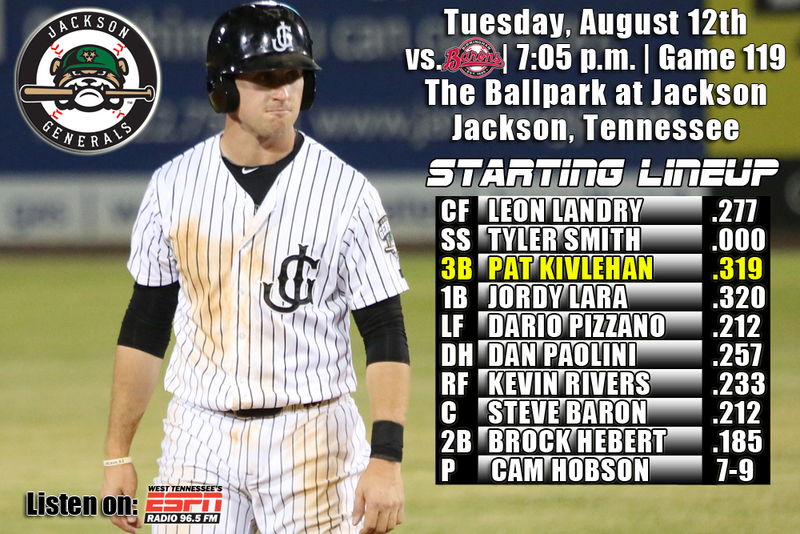 • Since 2008, the Generals are 36-17 (.679) against the Barons in games played at The Ballpark at Jackson. • Landry is the toughest in the league to strikeout – OF Leon Landry is 1st in the Southern League in fewest strikeouts, fanning just once in every 9.47 at-bats. • OF Jordy Lara his hit safely in each of his last 10 games, batting .425 (17×40) with 4 runs scored, 6 doubles, 1 home run, 12 RBI and 1 walk. Overall Lara is batting .333 (16×50) with 5 runs scored, 7 doubles, 1 home run, 12 RBI and 4 walks in 14 games with Jackson. • INF Patrick Kivlehan has hit safely in 8 of his last 9 games, batting .406 (13×32) with 8 runs scored, 2 doubles, 2 home runs, 7 RBI and 6 walks. • The Generals are in the midst of playing 21 games in 21 days to close the season (1-0) including 10 more home games (BIR, CHA) and road trips to Huntsville and Montgomery. 15 of the final 20 games are against North Division foes. Jackson is 30-25 against their remaining opponents. • INF/OF Patrick Kivlehan currently ranks 1st in the Southern League in batting (.320) and 3rd in slugging percentage (.525). Kivlehan also ranks 4th in the M’s organization in average (.308), 4th in HR (19) and 1st in RBI (95) between Jackson and High Desert. Kivlehan ranks T-3rd in all of MiLB having played in 1178games this season. 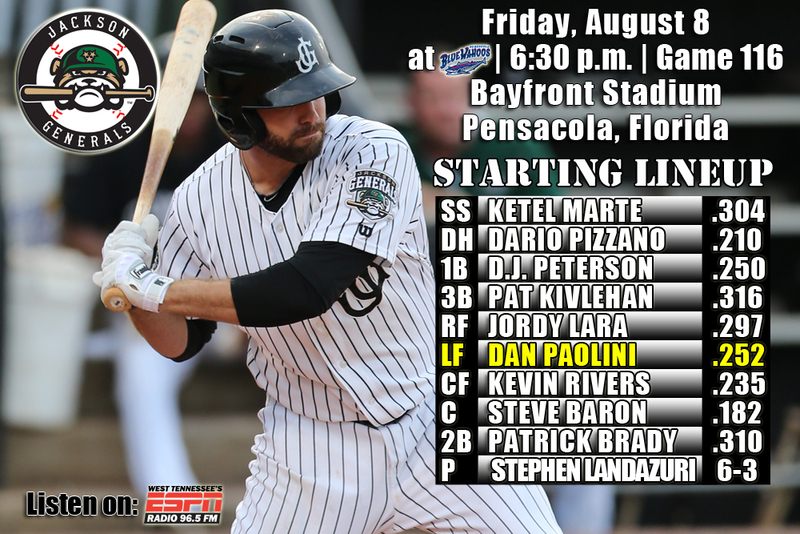 • The Generals begin a 6-game series in 5 days with their North Division rival Birmingham Barons…Jackson is 6-3 this season against the Barons and 28-30 at home this season…the Generals have won 4 of their last 7 series’ overall, but dropped 3 of 5 on recent road trip at Pensacola. • The Generals held a 2-0, 6-5 and 7-6 lead, but ultimately fell to Pensacola 9-8 on Sunday afternoon. • RF/3B Patrick Kivlehan (2×4, 3 R, 2B, HR, 5 RBI) recorded his 10th home run with Jackson, while driving in a season-high 5 batters. DH Jordy Lara (2×4, 2B, 2 RBI) recorded 2 hits and drove in 2 runs, while C Carlton Tanabe (1×3, RBI) picked up Jackson’s only other RBI. • Starter Tyler Pike (0.2,3,5,5,1,1,2HR) allowed 5 runs, including 2 home runs, in only 0.2 innings, but did not factor into the decision. Relivers RH Matt Brazis (3.0,0,0,0,2,2), RH Moises Hernandez (1.2,4,3,3,2,0), LH Nick Hill (0.2,1,1,1,1,1) and RH Stephen Shackleford (2.0,1,0,0,0,3) combined to allow 4 runs over 7.1 innings. Hernandez recorded the loss after allowing 3 runs in the bottom of the 6th inning. • INF/OF Patrick Kivlehan currently ranks 2nd in the Southern League in batting (.319) and 3rd in slugging percentage (.525). Kivlehan also ranks 4th in the M’s organization in average (.307), 4th in HR (19) and 1st in RBI (95) between Jackson and High Desert. Kivlehan ranks T-3rd in all of MiLB having played in 117 games this season. • Barons visit Jackson again – The Generals host Birmingham for the second time this season and are 3-1 in games at Jackson and 6-3 overall…As a team the Generals are batting .321 against Birmingham this season with 50 runs scored in 9 games. • Since 2008, the Generals are 35-17 (.673) against the Barons in games played at The Ballpark at Jackson. • August Power Surge – The Generals have blasted a league-leading 12 homer runs in 9 games so far this month. The .263 average ranks 3rd in the league so far this month. • Landry is the toughest in the league to strikeout – OF Leon Landry is 1st in the Southern League in fewest strikeouts, fanning just once in every 9.35 at-bats. • OF Jordy Lara his hit safely in each of his last 9 games, batting .417 (15×36) with 4 runs scored, 6 doubles, 1 home run, 10 RBI and 1 walk. Overall Lara is batting .320 (14×46) with 5 runs scored, 7 doubles, 1 home run, 10 RBI and 4 walks in 13 games with Jackson. • INF Patrick Kivlehan has hit safely in 7 of his last 8 games, batting .400 (12×30) with 8 runs scored, 2 doubles, 2 home runs, 7 RBI and 4 walks. • The current active Mariners roster features 12 former Generals. 3B Kyle Seager was named an American League All-Star. •,Roenis Elias, Tom Wilhelmsen, Dominic Leone and Yoervis Medina, Erasmo Ramirez and Taijuan Walker are members of the M’s pitching staff. • Dustin Ackley, Michael Saunders,, Kyle Seager, Brad Miller, Jesus Sucre, Mike Zunino and Chris Taylor are position players. • Fans can listen to all 140 games this season on the flagship home of the Generals, 96.5 ESPN. Each game will also be streamed on jacksongeneralsbaseball.com and the TuneIn Radio App. Calling the games will be 2013 Southern League Broadcaster of the Year, Chris Harris. • Each home game will be aired live on MiLB.TV. • With the series tied at 2-2, the Generals play the rubber match of the 5-game road series at Pensacola…are 5-5 rubber games this season…the Generals have won 4 of last 6 series’ and won 3 of 5 from Montgomery in last homestand…Jackson is 23-34 away from home this season. • DH Dan Paolini hit 2 home runs and drove in 3 runs to lead Jackson to a 7-5 win over Pensacola on Saturday night. • Paolini (4×5, 2 R, 2 HR, 3 RBI) led the team in hits and RBI, while recording his 3rd career 2-home run game (last: 8/29/12 vs. Burlington; 3×4, 3 R, 2 HRn, RBI. RF Patrick Kivlehan (3×5, R, 2B), 1B Jordy Lara (2×6, 2B, RBI) each recorded at least 2 of the team’s 15 hits. • Starter Victor Sanchez (3.2,6,5,5,2,2,RH) allowed 5 runs on 6 hits over 3.2 innings, but did not factor into the decision. LH Kyle Hunter (2.1,1,0,0,0,0,1) earned his 3rd win, allowing only 1 hit and striking out 1 over 2.1 scoreless innings. RH Trevor Miller (2.0,2,0,0,0,0) held the Blue Wahoos scoreless over 2.0 innings in relief, while RH Mayckol Guaipe eared a 1-2-3) 10th save of the season w/ a 1-2-3 scoreless innings. • After Saturday nights 7-5 win over Pensacla, SS Ketel Marte was promoted to AAA Tacoma. The 20-year-old was a 2014 Southern League All-Star. • INF/OF Patrick Kivlehan currently ranks T-3rd in the Southern League in batting (.316) and 3rd in slugging percentage (.512). Kivlehan also ranks 5th in the M’s organization in average (.304), 4th in HR (18) and 2nd in RBI (90). • Kivlehan has hit safely in 19 of his last 23 games, batting .338 (30×85) with 15 runs scored, 7 doubles, 3 triples, 3 home runs, 15 RBI, 13 walks and 3 stolen bases. He also has hit safely in 24 of his last 29 games (since 7/8), batting .350 (38×105) with 21 runs scored, 8 doubles, 4 triples, 4 home runs, 20 RBI, 15 walks and 3 stolen bases. • SS Ketel Marte currently ranks 6th in the league batting (.302), 1st in hits (134), 1st in at-bats (443) and T-5th in doubles (27). • Hello Again Blue Wahoos – The Generals are taking on Pensacola for the first time since a home series, April 30-May 4 in Jackson where the Wahoos took 3 of 5. • Jackson leads the overall series against Pensacola, 16-13 and are 10-9 in games played at Bayfront Stadium, including winning 4 of 5 during last series in Pensacola July 4-8, 2013. • Home Sweet Sunshine State – Jackson has 3 players on its roster that hails from the state of Floriday – RHP Matt Brazis (Tampa), LHP Tyler Pike (Winter Haven) and C Steve Baron (Miami). It’s the 2nd-most state represented on the roster to California. 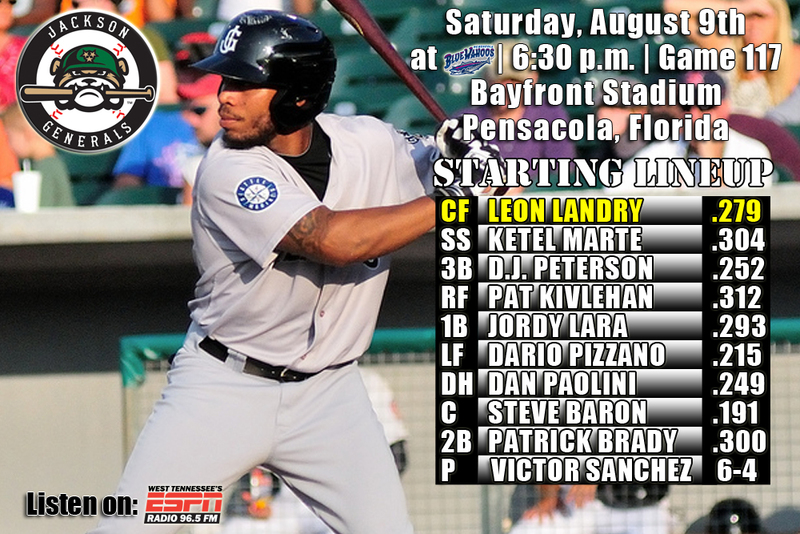 • Landry is the toughest in the league to strikeout – OF Leon Landry is 1st in the Southern League in fewest strikeouts, fanning just once in every 9.45 at-bats. • Summer of Hitting – The Generals are leading the Southern League in batting since June 1st, batting .276 (553/2,005) with 39 home runs, 114 doubles and 25 triples in 60 games. • SS Ketel Marte currently has a 9-game hit streak, batting .351 (13×37) with 6 runs scored, 2 doubles, 1 home run and 4 RBI.. This is Marte’s 6th hitting streak of 2014 of 7 or longer. • After recording 1 hit in his first 14 AA at-bats (.071), OF Jordy Lara his hit safely in each of his last 8 games, batting .406 (13×32) with 4 runs scored, 5 doubles, 1 home run, 8 RBI and 1 walk. Overall Lara is batting .304 (14×46) with 5 runs scored, 6 doubles, 1 home run, 8 RBI and 4 walks in 10 games with Jackson. INF Patrick Kivlehan has hit safely in 6 of his last 7 games, batting .385 (10×26) with 5 runs scored, 1 double, 1 home run, 2 RBI and 4 walks. • With the Blue Wahoos leading the current series 2-1, the Generals play game 4 of the 5-game road series at Pensacola…the Generals have won 4 of last 6 series’ and won 3 of 5 from Montgomery in last homestand…Jackson is 23-34 away from home this season. • The Generals out hit the Blue Wahoos 7-5, but it wasn’t enough as Jackson fell to Pensacola 5-1 on Friday night. • DH Dario Pizzano (2×4) recorded the team’s only multi-hit game, while SS Ketel Marte (1×4), 1B D.J. Peterson (1×3, BB), RF Jordy Lara (1×4), CF Kevin Rivers (1×4, R, 2B) and C Steve Baron (1×3, RBI) each recorded 1 of the Generals 7 hits. • Starter Stephen Landazuri (5.0,5,5,2,2,4,HR) picked up the loss, after allowing 5 runs (2 ER) on 5 hits over 5.0 innings. RH Moises Hernandez (2.0,0,0,0,0,4) and LH Nick Hill (1.0,0,0,0,0,1) combined hold the Blue Wahoos hitless and strikeout 5 in 3.0 scoreless innings. • Since July 1, tonight’s starter Victor Sanchez is 3-0 with a 2.34 ERA (11 ER, 42.1 IP) in last 7 starts. Duing this stretch he has limited opponents to a .214 (33×1154) average, while walking 10 and striking out 34. • INF/OF Patrick Kivlehan currently ranks 4th in the Southern League in batting (.312) and 3rd in slugging percentage (.507). Kivlehan also ranks 6th in the M’s organization in average (.302), 4th in HR (18) and 2nd in RBI (90). • Kivlehan has hit safely in 18 of his last 22 games, batting .338 (27×80) with 14 runs scored, 6 doubles, 3 triples, 3 home runs, 15 RBI, 13 walks and 3 stolen bases. He also has hit safely in 23 of his last 28 games (since 7/8), batting .350 (35×100) with 20 runs scored, 7 doubles, 4 triples, 4 home runs, 20 RBI, 15 walks and 3 stolen bases. • SS Ketel Marte currently ranks 6th in the league batting (.304), 1st in hits (133), 1st in at-bats (438) and T-5th in doubles (27). 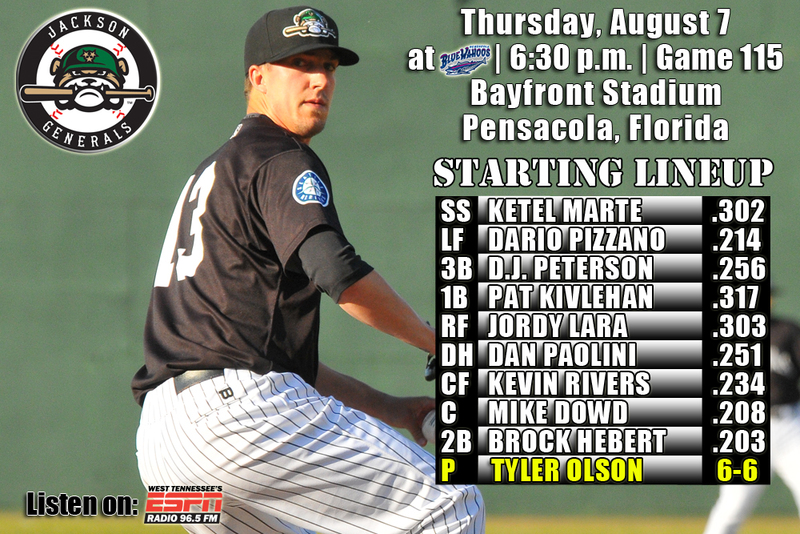 • Jackson leads the overall series against Pensacola, 15-13 and are 9-9 in games played at Bayfront Stadium, including winning 4 of 5 during last series in Pensacola July 4-8, 2013. • Relieving Guaipe – RHP Mayckol Guaipe has a 2.30 ERA in 31 games this season, with 45 strik eouts… ranks 4th among SL relievers having just walked 8 batters in 47.0 IP…he also ranks 3rd in fewest baserunners/9IP ratio at 8.62 (45/47.0 IP). • SS Ketel Marte currently has an 8-game hitting streak, batting .375 (12×32) with 5 runs, 2 doubles, 1 home run and 4 RBI. This is Marte’s 6th hitting streak of 2014 of 7 or longer. • OF Jordy Lara has hit safely in 7 straight games, batting .407 (11×27) with 4 doubles, 1 home run and 7 RBI. This is after starting his time in Jackson going 1×14. • INF Patrick Kivlehan went 0x4 Friday ending a Southern League best 32-game on-base streak batting .330 (38×115) with 7 doubles, 4 triples, 5 home runs, 22 RBI and 16 walks, with a .419 on-base percentage. Kivlehan also had reached base safely in 36 straight road games batting .338 (46×136) with 9 doubles, 3 triples, 5 home runs, 31 RBI, 15 walks and a .408 on-base percentage. • With the current series tied 1-1, the Generals play game 3 of the 5-game road series at Pensacola…the Generals have won 4 of last 6 series’ and won 3 of 5 from Montgomery in last homestand…Jackson is 23-33 away from home this season. • The Generals rallied for 2 runs in the top of the 9th inning, but it wasn’t enough to overcome 2 costly errors falling 3-2 at Pensacola. • SS Ketel Marte had 2 of Jackson’s 7 hits on Thursday while DH Dan Paolini (1×3) had a home run and 1B Patrick Kivlehan (1×4), RF Jordy Lara (1×4), CF Kevin Rivers (1×4) and C Mike Dowd (1×4) had 1 hit each. • Pensacola took advantage of Jackson errors and scored their first 2 runs in the 2nd and 5th innings. • Starter Tyler Olson (5.2,3,2,0,0,7) suffered the tough luck loss giving up just 2 unearned runs, while striking out 7, which was the 5th time he has struck out 7 or more in a start this season. RH Stephen Shackleford (1.1,1,0,0,0,3) added his 4th straight scoreless outing and RH Matt Brazis (1.0,2,1,1,1,1) allowed a run in the 8th inning. • Jordy Lara’s grand slam in the 9th inning on Wednesday was Jackson’s 5th of the season (Blash 4/3, Rivers 4/11, Paolini 5/10, Pizzano 6/2). Jackson has 5 of the 26 grand slams in the Southern League this season. • Lara’s grand slam was his first home run of the season. Dario Pizzano’s grand slam on 6/2 was also his first Double-A homer. • After recording 1 hit in his first 14 Jackson at-bats (.071), OF Jordy Lara his hit safely in each of his last 6 games, batting .435 (10×23) with 4 runs scored, a home run, 4 doubles, 7 RBI and 1 walk. Overall Lara is batting .297 (11×37) with a home run, 5 runs scored, 5 doubles, 7 RBI and 4 walks in 9 games with Jackson. • INF/OF Patrick Kivlehan currently ranks 3rd in the Southern League in batting (.316) and 3rd in slugging percentage (.514). Kivlehan also ranks 6th in the M’s organization in average (.304), 4th in HR (18) and 2nd in RBI (90). • SS Ketel Marte currently ranks 6th in the league batting (.304), 1st in hits (132), 1st in at-bats (434) and T-5th in doubles (27). • Jackson leads the overall series against Pensacola, 15-12 and are 9-8 in games played at Bayfront Stadium, including winning 4 of 5 during last series in Pensacola July 4-8, 2013. • Homering Generals – The Generals have hit 8 home runs in 6 August games, which leads the Southern League. Sunday, Jackson homered 4 times, which was the most since Septemeber 2, 2012 at Jackson. • Summer of Hitting – The Generals are leading the Southern League in batting since June 1st, batting .277 (546/1,972) with 39 home runs, 113 doubles and 25 triples in 59 games. • INF Patrick Kivlehan has reached base safely in a Southern League best 32 straight games batting .330 (38×115) with 7 doubles, 4 triples, 5 home runs, 22 RBI and 16 walks, with a .419 on-base percentage. He also has hit safely in 18 of his last 21 games, batting .355 (27×76) with 14 runs scored, 6 doubles, 3 triples, 3 home runs, 15 RBI and 13 walks. Kivlehan also has reached base safely in 36 straight road games batting .338 (46×136) with 9 doubles, 3 triples, 5 home runs, 31 RBI, 15 walks and a .408 on-base percentage. 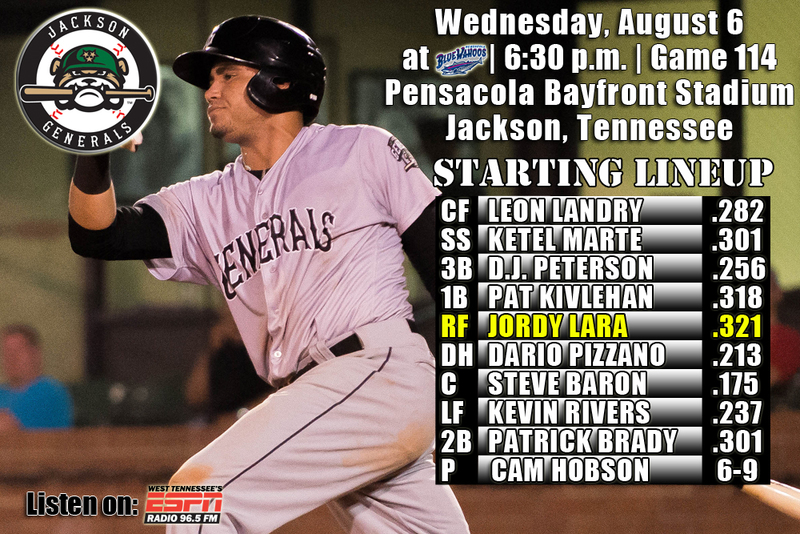 • Leading the series, 1-0, the Generals play game 2 of the 5-game road series at Pensacola…the Generals have won 4 of last 6 series’ and won 3 of 5 from Montgomery in last series…Jackson is 23-32 away from home this season. • The Generals scored in four straight innings from the 3rd through 6th and DH Jordy Lara (1×5) smashed a grand slam homer in the 9th as Jackson defeated Pensacola. 9-3 on Wednesday night. • 2B Patrick Brady (2×4) hit a sol homer in the 5th and D.J. Peterson (1×4) homered in the 4th while SS Ketel Marte (2×5) added a multi-hit game in the win. • LF Dario Pizzano (1×4) broke a 3-3 tie in the 6th with a 2 out 2-run double. • Starter Cam Hobson (5.0, 6,3,3,1,3) became Jackson’s first 7-game winner on the mound as LH Kyle Hunter (1.0,0,0,0,0,0) added a hold and RH Trevor Miller (3.0,1,0,0,0,4) notched his first career save tossing the final three frames. • After recording 1 hit in his first 14 Jackson at-bats (.071), OF Jordy Lara his hit safely in each of his last 5 games, batting .571 (9×19) with 4 runs scored, a home run, 3 doubles, 7 RBI and 1 walk. Overall Lara is batting .303 (10×33) with a home run, 5 runs scored, 4 doubles, 7 RBI and 4 walks in 9 games with Jackson. • INF/OF Patrick Kivlehan currently ranks 3rd in the Southern League in batting (.317) and 3rd in slugging percentage (.518). Kivlehan also ranks 6th in the M’s organization in average (.306), 4th in HR (18) and 2nd in RBI (90). • SS Ketel Marte currently ranks 6th in the league batting (.302), 1st in hits (130), 1st in at-bats (430) and T-5th in doubles (27). • Jackson leads the overall series against Pensacola, 15-11 and are 9-7 in games played at Bayfront Stadium, including winning 4 of 5 during last series in Pensacola July 4-8, 2013. • Kiss It Goodbye x4 – The Generals smacked 4 home runs in game Sunday for the first time since Septemeber 2, 2012. In that game vs. Jacksonville Nate Tenbrink, Brad Miller, Denny Almonte and Joe Dunigan went deep. • Extra Base Success – Last Thursday, Leon Landry collected his 6th triple of the season which was Jackson’s 40th as a team, which ranks 2nd in the league. Last season Jackson had 41 through the entire season…Jackson also ranks 3rd in the league in doubles with 208 on the season. • Summer of Hitting – The Generals are leading the Southern League in batting since June 1st, batting .278 (539/1,939) with 38 home runs, 112 doubles and 25 triples in 58 games. • INF Patrick Kivlehan has hit safely in 17 of his last 20 games, batting .361 (26×72) with 14 runs scored, 6 doubles, 3 triples, 3 home runs, 15 RBI and 13 walks. He also has hit safely in 22 of his last 26 games (since 7/8), batting .3750(34×92) with 20 runs scored, 7 doubles, 4 triples, 4 home runs, 20 RBI and 15 walks. 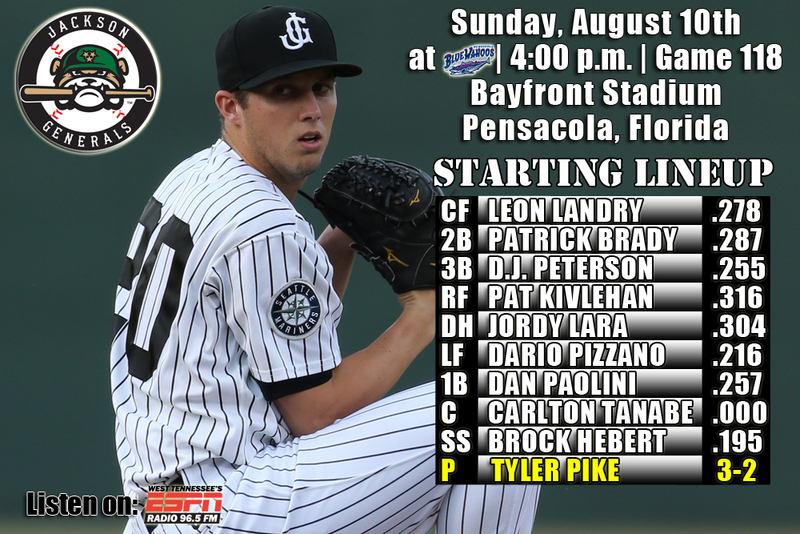 • The Generals open a 5-game road series at Pensacola today with game 1 of the set…Generals have won 4 of last 6 series’ coming in and won 3 of 5 from Montgomery in last series…Jackson is 23-32 away from home this season. • LF Dario Pizzano (0x2, RBI, SF) and DH Dan Paolini (0x2, RBI, SF) each drove in runs on back-to-back sacrifice flies in the bottom of the 5th inning as Jackson came-from-behind to defeat Montgomery 2-1 on Monday. • RF Jordy Lara (2×3, R, 2B) led the team with 2 hits, while 2B Ketel Marte (1×3) and 3B Patrick Kivlehan (1×3, R) each recorded 1 of the Generals 4 hits. • Starter Tyler Pike (5.1,4,1,1,3,0) earned his 3rd win with Jackson, allowing 1 run on 4 hits over 5.1 innings. RH Moises Hernandez (1.2,1,0,0,1,0), RH Stephen Shackleford (0.2,0,0,1,1) and RH Mayckol Guaipe (1.1,0,0,0,1,1) combined to hold the Biscuits scoreless over the final 3.2 innings in relief. Guiape earned his 9th save, after allowing 1 walk and striking out 1 in 1.1 innings to close out the game. • After recording 1 hit in his first 14 Jackson at-bats (.071), OF Jordy Lara his hit safely in each of his last 4 games, batting .571 (8×14) with 3 runs scored, 3 doubles, 3 RBI and 1 walk. Overall Lara is batting .321 (9×28) with 4 runs scored, 4 doubles, 3 RBI and 4 walks in 8 games with Jackson. • Since May 16, OF Leon Landry has hit safely in 55 of 65 games, batting .332 (86×259) with 42 runs scoed, 17 doubles, 6 triples, 1 home run, 20 RBI, 10 walks and 18 stolen bases. During this 65-game stretch he has raised his season average from .155 to .282. • INF/OF Patrick Kivlehan currently ranks T-1st in the Southern League in batting (.318) and 3rd in slugging percentage (.521). Kivlehan also ranks 6th in the M’s organization in average (.306), 4th in HR (18) and 2nd in RBI (90). • SS Ketel Marte currently ranks 6th in the league batting (.301), 1st in hits (128), 1st in at-bats (425) and T-5th in doubles (26). • Hello Again Blue Wahoos – The Generals take on Pensacola for the first time since a home series, April 30-May 4 in Jackson where the Wahoos took 3 of 5. • Jackson leads the overall series against Pensacola, 14-11 and are 8-7 in games played at Bayfront Stadium, including winning 4 of 5 during last series in Pensacola last July 4-8. • Extra Base Success – Last Thursday, Leon Landry collected his 6th triple of the season which was Jackson’s 40th as a team, which ranks 2nd in the league. Last season Jackson had 41 through the entire season…Jackson also ranks 3rd in the league in doubles with 205 on the season. • Landry is the toughest in the league to strikeout – OF Leon Landry is 1st in the Southern League in fewest strikeouts, fanning just once in every 9.46 at-bats. • Summer of Hitting – The Generals are leading the Southern League in batting since June 1st, batting .279 (530/1,903) with 35 home runs, 109 doubles and 25 triples in 57 games. • INF Patrick Kivlehan has hit safely in 16 of his last 19 games, batting .368 (25×68) with 13 runs scored, 6 doubles, 3 triples, 3 home runs, 15 RBI and 12 walks. He also has hit safely in 21 of his last 25 games (since 7/8), batting .375 (33×88) with 19 runs scored, 7 doubles, 4 triples, 4 home runs, 20 RBI and 14 walks.